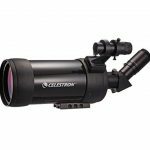 This Gosky 20-60X 80 Porro Prism Spotting Scope features an angled body design. The outer shell is made out of durable magnalium, featuring shock absorbing armor in case you drop it. Besides that, it also features 100% waterproof design, as well as anti-fogging features. 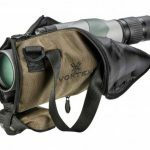 The scope is of course colored black and green, so it will fit in with the rest of your gear, whether you’re head to toe in camo, or just rocking that nature-loving–guy vest and hat. A metal tripod is included in the package. Great angles are easily managed, as well as perfect stability in capturing images or videos or plainly looking through the scope. Even if you manage to tip it over, that shock absorbing rubber is sure to do its work protecting the optics inside. 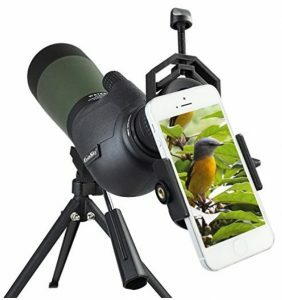 You can even use this scope with a phone, as it comes with a unique digiscoping cell phone adapter, which makes the whole process of making high-resolution pictures and videos a blast. Simply screw on the included adapter, snap your phone in place, and you’re good to go. The package includes an eyepiece shield which can be stretched out. When not using the 20-60X 80 Porro Prism scope, you can store it in the included bag, which provides more than enough protection. Just remember to keep both lens caps on it for extra protection when not in use.